Vail, Colorado may be a beautiful place, but it is certainly not a place to go if you’re on a budget. Lift tickets are crazy expensive and the food isn’t much cheaper. But there are a couple more reasonable places in town and The Red Lion is one of them. As you might expect, The Red Lion is a British Pub and has your classic pub fare. When it came to my meal, I only really had eyes for the burgers. My burger of choice was the Bleu Sky Burger, presumably named for how blue the skies are when there isn’t a snowstorm blowing through Vail. 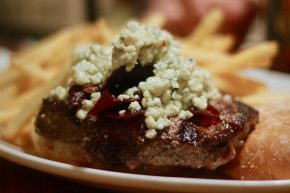 This burger was topped with bleu cheese and bacon, plus some lettuce, tomato and onion that I was quick to order without. I ordered mine medium-rare and was very happy to find it prepared that way. Hey, you never know when you’re in a touristy spot. In fact, beyond the color of the meat, I was impressed by the pile of bacon and bleu cheese on top of the burger. They made for a nice blend of smokey, salty and cheesy. The burger even had a nice sear that I could appreciate. There were some fries on the side that didn’t stick out as anything special, but were at least a good partner to the meat and cheese. By the time I was nearly finished, the juiciness of the burger had rendered the bun into a gooey mess. If I had any complaint it would be that the bun simply couldn’t hold up. Nonetheless, this was a solid burger that fulfilled my burgerly desires.